Designed with your comfort and relaxation in mind, Villa Beach 3 is one of the rare residences in Mauritius that actually opens directly onto the beach. By this token, you will be able to make full use of the silky sands and delightful turquoise ocean. In fact, Villa Beach 3 is found on one of the most beautiful beaches in Mauritius, which radiates sunshine and refreshing waters. Villa Beach 3 is equipped with three bedrooms. 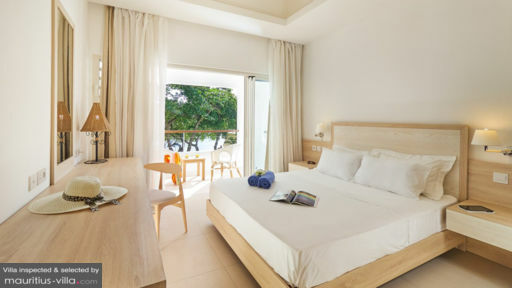 All the bedrooms feature an air-conditioning unit to shelter you from the notorious island heat. The comfortable bedrooms also sport en-suite bathrooms in order to enhance your comfort. Boasting a rustic charm, the master bedroom also includes a walk-in closet and a digital safe. All the bedrooms overlook either the ocean or the garden. The two guest bedrooms are fitted with a queen-sized bed each, while the master bedroom boasts a king-sized bed. Villa Beach 3 is found in a gated and perfectly secure complex which comes with a lush tropical garden. 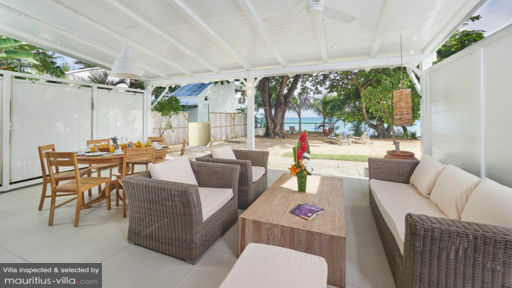 Your villa is also equipped with a veranda and sun beds that overlook the ocean, which means that you can simply lounge back, close your eyes and listen to the soft sloshing of the waves as you work on getting that distinctively tropical tan. While there’s no pool on the premises, the ocean is literally on your doorstep: indeed, you simply need to cross through the gates to reach the silky beach of Pereybere village. 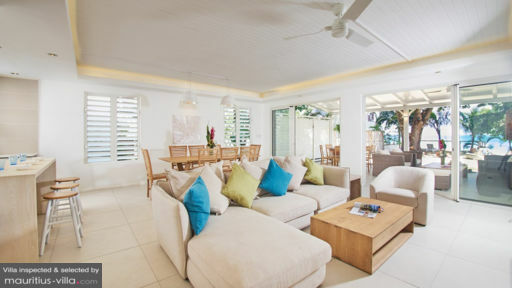 The living areas are wide and spacious to echo the overall open-plan architecture of the villa. The airy lounge area is enhanced by a flat-screen television, music system and offers generous views of the garden. You’ll also find a dining room that can very comfortably accommodate extra guests. More importantly, the fully equipped kitchen comes with everything that you might need to prepare your meals in the comfort of your villa. For example, there’s a kettle, Nespresso coffee machine, gas stove, electric stove, fridge, freezer and the likes. Upon your arrival, you’ll also find a bottle of local wine as well as a welcome basket of seasonal fruit to welcome you to the villa. In the kitchen, there’s also different types of utensils which you can use. All the living areas overlook the spacious 50 sqm veranda which promises glorious sunsets and sunrises. To ensure that your vacation goes as smoothly as possible, Villa Beach 3 offers its residents a plethora of services. For example, on weekdays and Saturdays, a housekeeper will show up to take care of the cleaning. Upon request and for an additional fee, she can also take care of the ironing, cooking and laundry. She will also change your sheets every three nights, while replacing your towels on a daily basis. Additionally, guests of the villa will receive a free breakfast every morning. In the residence, there’s also a bar, pool area as well as luggage storage facilities. The beautiful village of Pereybere is just a short drive from the capital of Port-Louis, which is especially known for its waterfront mall, The Caudan. Over there, you’ll find just about anything you might need in terms of shopping. Overlooking the harbor, this mall also has a large food court, a casino, cinemas and the likes.